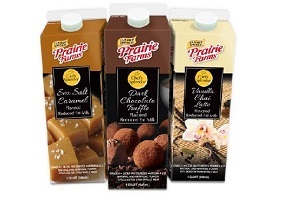 Prairie Farms has launched three limited edition Chef’s Splendour milks which are claimed to “set the standard for new flavour adventures”. Made with “family-sourced reduced fat milk” which is said to be free from artificial growth hormones, the product comes in Sea Salt Caramel, Dark Chocolate Truffle and Vanilla Chai Latte flavours. According to an article in FoodBev, the flavours have been specially crafted by “Prairies Farms’ corporate chef” and are a response to “ever-evolving consumer preferences and an appetite for exciting products and tastes”. The milk is further claimed to be ultra-pasteurised for an extended refrigerated shelf life of 75 days and is packed in re-closeable spout gable-top quart cartons. Prairie Farms Chef’s Splendour Milk will only be available during summer.